Visiting Woodstock Vermont feels a bit like taking a bridge back in time. Our recent visit there after dropping our daughter (and a van load of her stuff) off to college meant we didn't have an inch of room to bring our high tech mountain bikes or kayaks with carbon fiber paddles. So we included activities in our itinerary that you could imagine 19 th century summer visitors enjoying over 200 years ago after arriving by train. And Woodstock is the perfect place to enjoy old fashioned low tech recreation! A walk around town across a covered bridge, a hike up Mount Tom, a picnic on the Green, strolling past Central street shops with a real Vermont Ice cream cone, enjoying a relaxing glass of wine on the porch of a Victorian inn, and ending the day with a candle lit dinner out at one of Vermont's many top notch restaurants with locally sourced ingredients, are all things you can imagine people doing in Woodstock a hundred and twenty years ago! Woodstock Vermont was founded as a town by Europeans before the American Revolution, but it really became a tourist destination during the industrial revolution when its location, a short distance from White River Junction railroad station, made it an ideal place to visit for wealthy rusticators from New York and Southern New England. 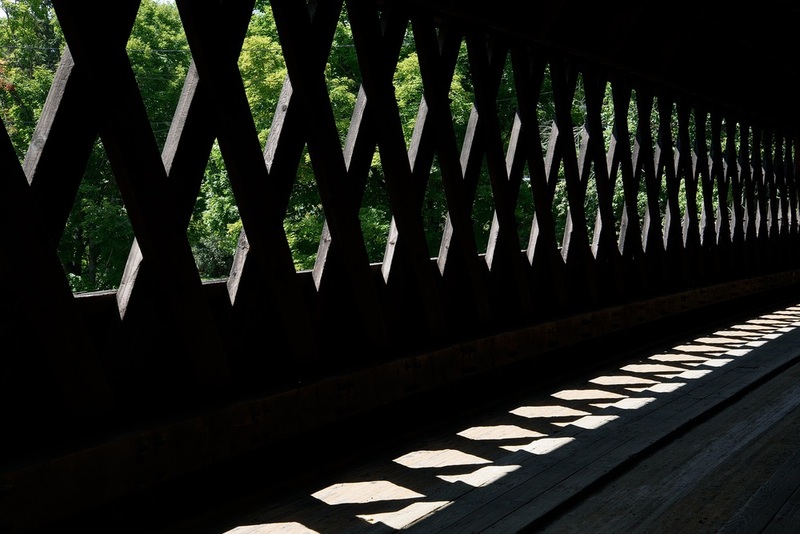 Covered bridges over the looping Ottauquechee are one of many "throwback" attractions that still have visitors flocking to Woodstock. 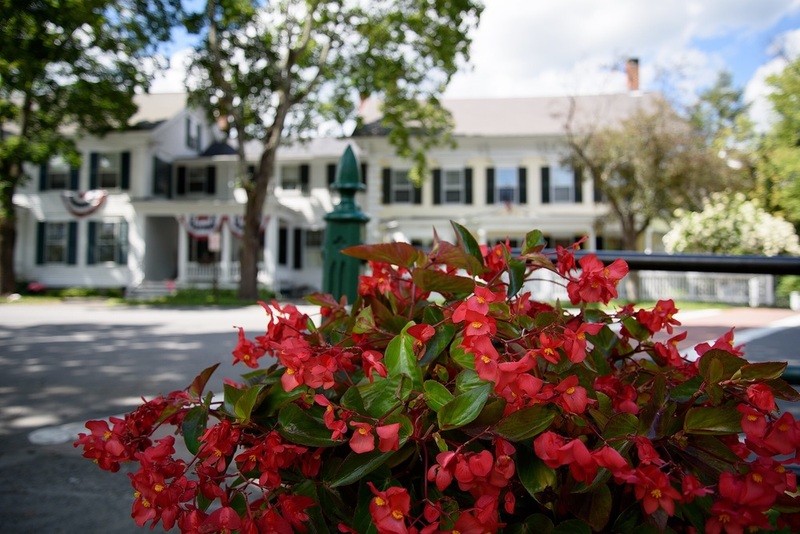 It's historic housing, miles of trails and Central St buildings have been meticulously preserved, and the Woodstock Inn has been welcoming guests since 1872. Even though this area offers plenty of modern day diversions, including state of the art ski areas, many activities enjoyed by visitors today still hew closely to popular pastimes of 200 years ago; dining on fresh local food, walking, biking, horse carriage rides, hiking a mountain, golf and Nordic skiing. A good starting point (with off street metered parking) is the information booth on Mechanic Street, with restrooms and a staffed information desk where you can get dining recommendations and plan your day. It's also where you can pick up a Walk Woodstock map http://www.walkwoodstock.com put out by the Woodstock Trails partnership. Described as "30 miles of historic trails joining two mountains and the village" The WTP is a coalition of organizations working to "enhance awareness, use and stewardship" of all the beautiful natural areas in the greater Woodstock area. The group not only comes together for that purpose, but they obviously have worked closely to create a huge contiguous natural area with easily navigable connections between them out of a patchwork of local parks, donated estates, and the recently formed (1992) Marsh-Billings-Rockefeller National Historic Park. To get a sense of Woodstock, you can start with the "village and two bridges" walk which will take you past the Green on Central St, across the Middle Bridge on Mountain Ave, past historic homes in a residential neighborhood on River St., where we enjoyed maple lemonade sold by a 4 year old raising money for the local animal shelter. Then we walked back across the Iron Bridge on Elm street back to the village shops and restaurants on Central St. The whole walk is less than a mile, very easy and scenic. I could imagine I was strolling in my hoop skirt, bonnet and parasol, but I was much more comfortable in my keen sandals, ball cap and shorts! Central street is lined with upscale boutiques and art galleries. During the August Saturday we visited, shops offered sidewalk sales. But I could imagine how cozy the shops and restaurants must be on a dark, snowy late afternoon in January. We had lunch at Brick Oven Trattoria on Central St. With indoor and outdoor seating, this restaurant advertises what it does best with a sign that includes a popular mathematical symbol! A place to get delicious brick oven pies! Alongside Central Street. a tiny pocket park by the Kedron Brook sits in the shadow of an old stone building. 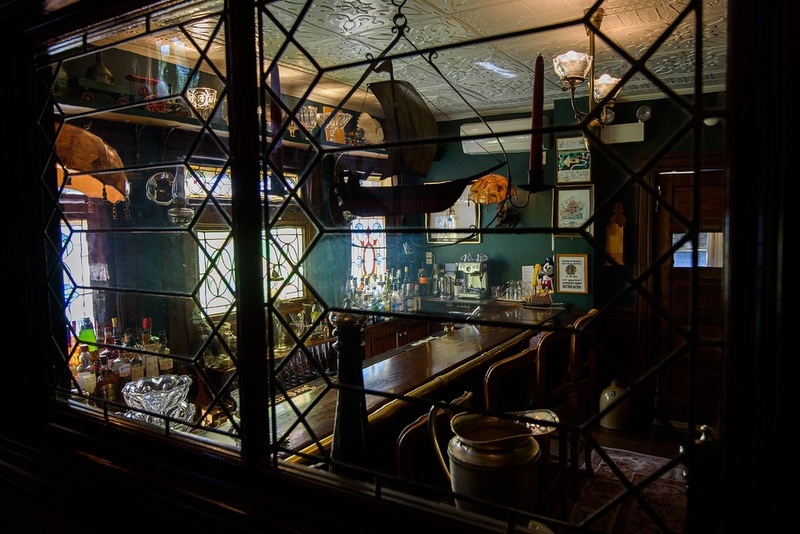 Although the Woodstock Inn on the Green is the most well known and expensive place to stay in town, there are a variety of more reasonably priced Victorian era inns, many of which look lovely, and get great reviews, even if they are a little closer to bustle of Central Street. The Village Inn was an excellent choice for us, bubblegum pink and set within easy walking distance of all the shops and restaurants, it was the perfect place for us. The rooms were decorated with a variety of interesting Victorian brick a brac and the owner, Evelyn provided a gourmet breakfast big enough to allow us to skip lunch. 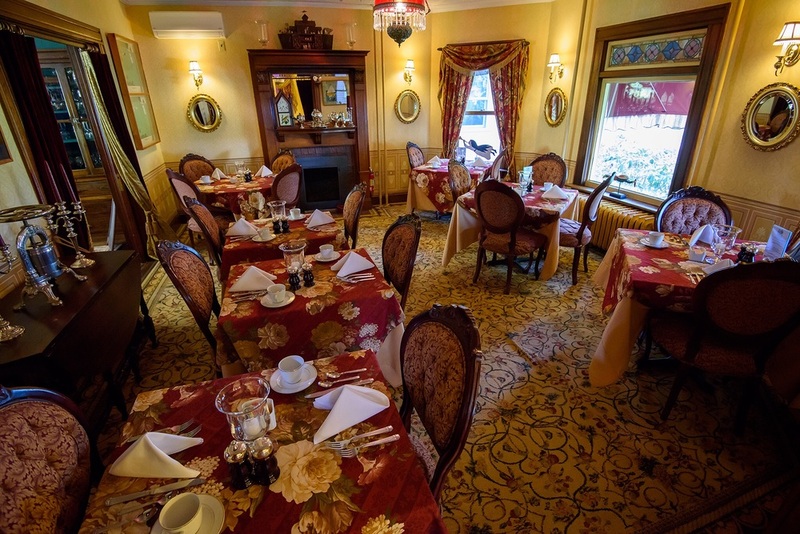 The Village Inn of Woodstock is centrally located for easy walking around town. A quiet porch on the second floor of the Village Inn was the perfect place for a complimentary glass of wine at happy hour. Mrs Faulkner built a switch back trail on her property, and it's a great work out! After achieving the summit, (ok it's only a 1/2 hour climb up a gentle slope, on which we were passed by 10 year olds loping up the trail) we were rewarded with this lovely view! Then we went on into the Billings Park part of the trails and circled a lovely little pond called The Pogue, and returned by the same route. The whole hike took us under two hours and the effort rewarded us with a mix of wooded uplands, ponds, fields and distant views Woodstock of the mountains. Trails are very well marked. For international or once-in-a-lifetime-trip visitors, Woodstock is the perfect "day trip" or overnight to tick Vermont off your life list during a 2 week or 10 day New England itinerary. If all the New England states can be synthesized into a few iconic experiences (Maine =lobsters and lighthouses, Vermont= covered bridges and maple syrup etc.) then Woodstock hits all the highlights if one doesn't have more time to spend in the state. (and I recommend you spend more time in the state!!) A hike through town and up Mt Tom, with a homemade Maple Walnut ice cream cone from the Mountain Creamery (Central St) http://www.mountaincreameryvt.com in the historic 19 th century town center of Woodstock is the quintessential "I've been to Vermont" day. For us, who like those Victorian visitors, we will be "passing through" the White River Junction quite a bit over the next four years and we plan to make it a regular stop. Maybe next time we might visit in the winter and will bring our high tech thermal clothing and modern skis, but Woodstock delivers even if you want to enjoy old school recreation circa 1890.